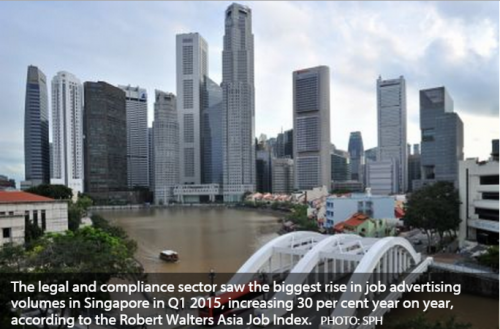 THE legal and compliance sector saw the biggest rise in job advertising volumes in Singapore in Q1 2015, increasing 30 per cent year on year, according to the Robert Walters Asia Job Index. Positions in anti-money laundering and financial crime, in particular, were in demand. Meanwhile, IT job advertising was up 18 per cent as firms strengthened their presence on social media and digital platforms. Advertising for accounting and finance jobs was also higher, rising 18 per cent. However, higher operating costs, which have encouraged the offshoring of manufacturing plants to more cost-effective markets in Asia, were the factor behind the 14 per cent drop in job ads for product and logistics operations. Ads for secretarial and support services were also down 20 per cent. Overall, however, the annual growth in job adverts for Singapore in Q1 2015 came to just 0.4 per cent. "Recruitment in Singapore is largely driven by competition in the candidate-short market, hence key challenges generally lie in attracting the best talent for the right positions," said Toby Fowlston, Robert Walters's managing director for South-east Asia. "To address this, the employment market has evolved to focus heavily on talent development and retention." He added: "Companies prioritise Singaporean professionals when hiring and that emphasis will continue throughout the year. Only when all channels of recruiting domestic talent have been exhausted do hiring managers expand their search to foreign candidates."